Honeyberries grow best in locations that receive half a day of sun, preferably in the morning. They grow well in partial shade along a woodland edge. 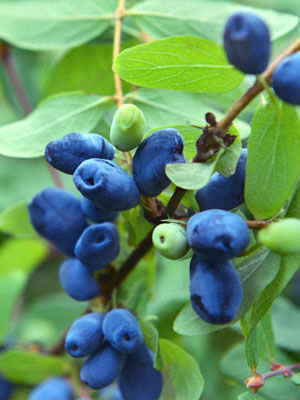 Honeyberries can tolerate cold to -40C (-40F), so they are among the most cold-hardy small fruits you can grow. Cultivars descended from Russian breeding lines bloom and bear earlier than Japanese types, which are often called haskaps. These cold-natured plants seldom produce well in areas where summer temperatures often rise above 30C (85F). Fertilise in late autumn by spreading a 1-inch (2.5 cm) layer of composted manure over the root zones of the plants. Slow-growing plants can be fed again in early summer.